Still, it was a good guitar, so I could get used to it, right? Not next to the other, it turns out. It was like playing a baby. I went to Charlottesville Music and asked Billy Brockman who I could get to refinish it locally. The answer was that the guy I’d used a couple of times already for other stuff did beautiful work, but had stopped doing finishes a couple of years before. Hmmm. So I called up John Flynn at Mass Street Music. He had a guy, a spare-time luthier whose limited work they often sold, who was a coatings engineer by vocation. He was terrific, a great guy, and didn’t charge enough. All of those things are profoundly true of Dave Seüferling, and this was the guitar that provided my lucky, unlikely introduction to him and to his stellar work. Crazy clean preamp cavity criss-crossing the top control cavity. The 9 volt is held perfectly in place against the walls of the cavity. Comfortably wedged. The cover crossing the crazing matches the guard I sent. When the guitar shipped from Missouri to Virginia, it was fresh and clean and thoroughly cured, but, on the way, it spent several days in blistering cold–cold bad enough to halt shipping–and my patience in unboxing it was already too late to prevent the start of the crazing that has since spread to cover the guitar. It looks good on it, at least. 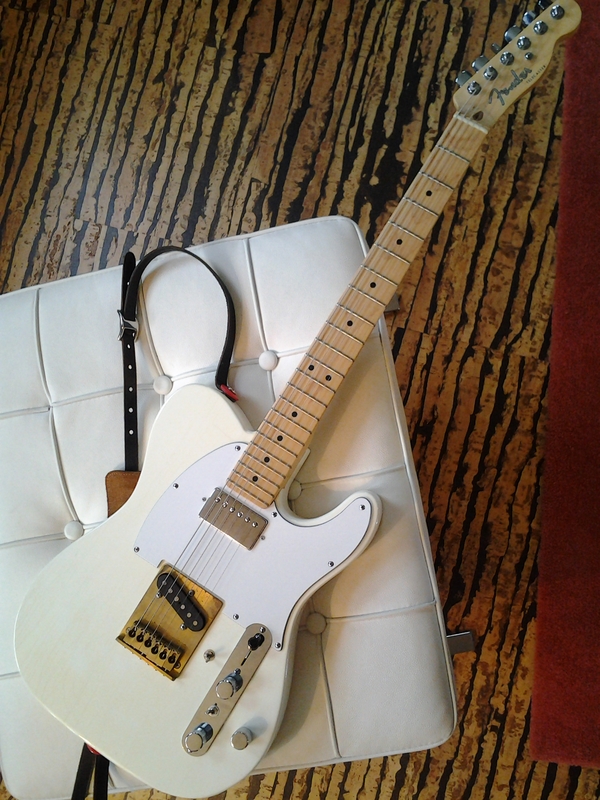 Everything came together perfectly, and this instantly became my favorite guitar. It’s the second of John McCleary’s three favorites. I almost immediately started talking to Dave about building me a mahogany thinline. That Duncan boost, in case you’re curious, ranges from a modest kick to an immoderate beating. I either hung them up not long after we moved back in or maybe just before we did–a couple of months after I had the olympic white tele back from Dave, anyway. Note the studfinder sitting on the Swart. 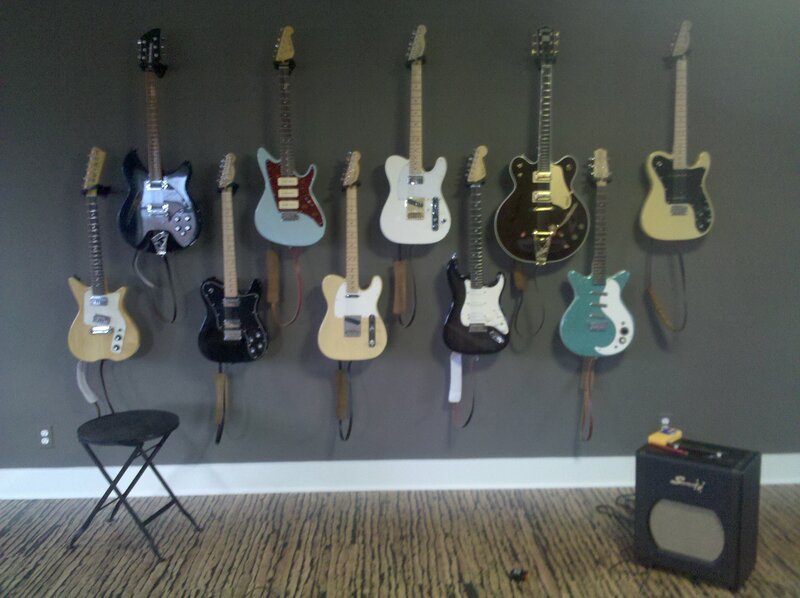 That one damn hanger is still out of place, now amid a lot more guitars. 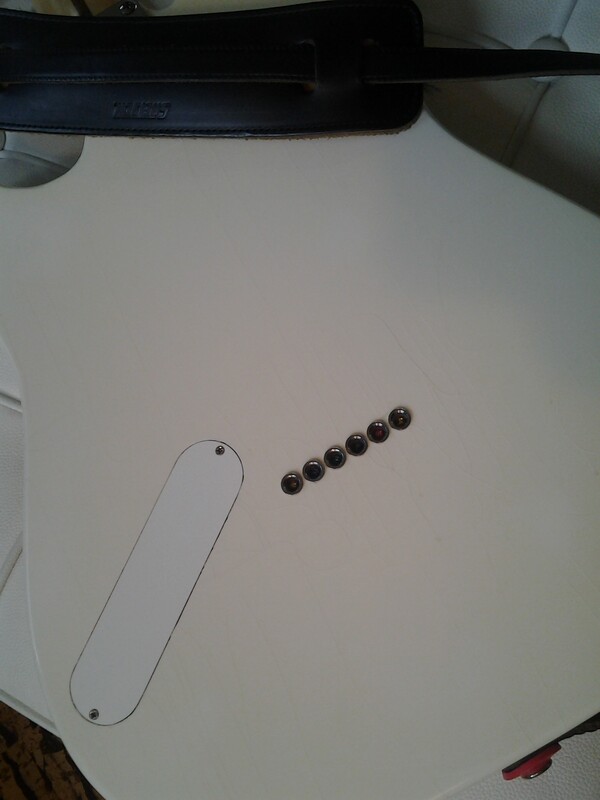 This snapshot precedes the work done on the strat, the rick, the TK 300, and the blonde tele. It’d be easier to eye the differences if the shot were higher resolution–them’s 2006 pixels–or at least better focused. The guitar’s sound is, in 2017, both better focussed and wider ranging thanks to 11-49s from https://www.thegts.co and a mastery string tree from mastery bridge.com (even on the ones without vibratos). Thanks for doing what you do, Gabriel and Woody.